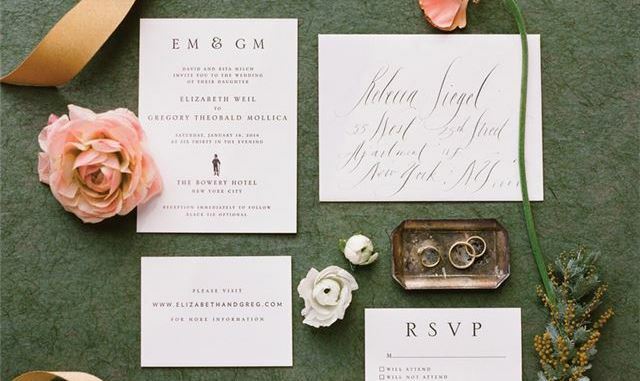 As we gear up for Wedding Season this summer and beyond, it is always great to be sure you have an Emily Post moment, and are on-point with all wedding etiquette, especially as it relates to your invitations! If your wedding is taking place in early June, invitations should be out now (urgent trip to the post office, anyone?) Fun tip: If you are here in Boston, the Fort Point Post Office located at South Station is a sorting center and is great getting for any last minute wedding correspondances, birthday cards or holiday cards to their intended recipients, fast! Feeling overwhelmed with the Dos and Don’ts of your I Dos? The Knot has a great Top Ten List of tips to ensure you are minding your Pre-Marital Manners before your mail your invites. -Make sure you are checking your contracts and aligning your RSVP dates to match what you have committed to venues and vendors. Remember that no matter how organized (or conscious of etiquette) you are, there are always things that can happen beyond your control. Small reply cards can get lost in the mail, and some guests will forget to return the RSVP on the requested date. Take a deep breath, keep your sense of humor and use a spreadsheet to keep yourself organized!